Redwood Heating and Air LLC is proud to serve the Covington community! About Covington, GA - Happy to be your hometown Heating & Air Conditioning Contractor! 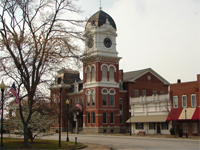 Covington, GA, is a Newton County city that also serves as the county seat. It is found about 35 miles from Atlanta and is home to about 13,400 residents. The community was incorporated and founded in 1822 and was named for U.S. Congressman Leonard Covington, a War of 1812 hero. This city encompasses the North Covington Historic District and the Covington Historic District, both of which can be found on the National Register of Historic Places. Covington is served by the Newton County School District, and higher educational opportunities in the area include campuses of Dekalb Technical College and Georgia Perimeter College. Covington is home to numerous attractions and things to do that attract both visitors and residents. Fans of the TV series the Vampire Diaries will like to book a tour of the area, while golf enthusiasts might like to set up a tee time with the Oaks Course. There are a variety of specialty shops located in the community, including Town Square Olive Oil and Balsamic Vinegar, the Cork Boutique and Gifts, and Spires Interiors and Gifts. Outdoor recreation is also popular in this community at Turner Lake and the Eastside Trail. Covington and the surrounding area are part of a humid subtropical climate zone, with residents enjoying four distinct and separate seasons. Precipitation is generous throughout the year, including during the hot and humid summer months. July is the hottest month of the year, and while the average high temperature is about 80 degrees, highs surpass 90 degrees more than 40 days per season. Central air is crucial to stay safe and comfortable throughout the summer. Winters in the area are cool, and thermostat readings will fall to freezing or lower nearly 50 days per year. Temperatures that drop below zero are rare but do occur. A heat pump or furnace will be needed during these months, but fortunately, the spring comes quickly when warm air from the Gulf pushes into the area.